The former Ulster Defence Association (UDA) leader Glen Barr, who played a key role in the Ulster Workers' Council strike of 1974, has died. Glen Barr, from Londonderry, died at Altnagelvin Hospital. He was 75. A trade union member who joined the loyalist UDA in the early days of the Troubles, he became the paramilitary organisation's north west leader. In recent years, he was involved in a range of community and reconciliation projects. 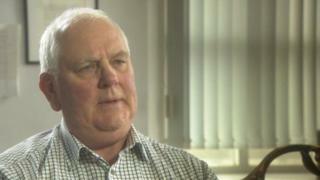 Glen Barr was a senior member of the UDA, the biggest loyalist paramilitary group in Northern Ireland. He was a senior member of the Vanguard Progressive Unionist Party in the mid-to-late 1970s. Glen Barr was a key organiser of the Ulster Workers' Council strike in 1974, which brought down the Sunningdale power-sharing executive. Later that year Glen Barr was one of a number of UDA leaders who visited Libya for talks with Colonel Gaddafi about potentially supporting an independent Northern Ireland. But he left politics in 1981 to return to community work in his native Derry, where he set up an employment and training scheme for disadvantaged young people. He was a founder of the Messines Peace project, which drew on the suffering experienced during the battles of World War One, to argue that in the future all disputes should be resolved through exclusively peaceful means. In 1998, the father of four appeared set to make a return to active politics when he took up a seat on the Northern Ireland Parades Commission, a move roundly condemned by nationalists, given his UDA past. But he resigned from the commission in April that year, after it banned an Apprentice Boys parade from the nationalist lower Ormeau Road in south Belfast. After leaving politics, he ran the Maydown Ebrington Group, that attempted to create employment in the Waterside area of Derry. He also worked closed with the former Irish government minister, Paddy Harte, on promoting awareness of the involvement of Irish nationalists in the two world wars.